Few things are more likely to cause heartache to devout parents than seeing their child leave the faith. And it seems, from media portrayals, that this is happening more and more frequently. But is religious change between generations common? How does religion get passed down from one generation to the next? How do some families succeed in passing on their faith while others do not? Families and Faith: How Religion is Passed Down across Generations seeks to answer these questions and many more. 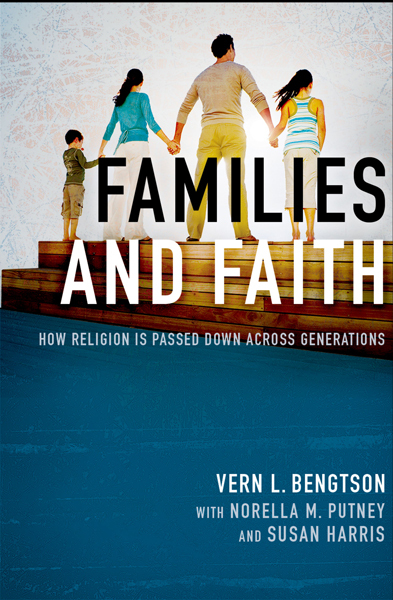 For almost four decades, Vern Bengtson and his colleagues have been conducting the largest-ever study of religion and family across generations. Through war and social upheaval, depression and technological revolution, they have followed more than 350 families composed of more than 3,500 individuals whose lives span more than a century--the oldest was born in 1881, the youngest in 1988--to find out how religion is, or is not, passed down from one generation to the next. What they found may come as a surprise: despite enormous changes in American society, a child is actually more likely to remain within the fold than leave it, and even the nonreligious are more likely to follow their parents' example than to rebel. And while outside forces do play a role, the crucial factor in whether a child keeps the faith is the presence of a strong fatherly bond. Mixing unprecedented data with gripping interviews and sharp analysis, Families and Faith offers a fascinating exploration of what allows a family to pass on its most deeply-held tradition--its faith.